The Jackalope has both mythological and literal origins that traverse across history. YouTubeThe jackalope is a mix of jackrabbit and antelope. The tall tales and history associated with the jackalope put the frightening critter right up there with some of the most legendary cryptids. With long antelope-esque horns protruding from a small rabbit head, the animal resembles a small deer. As it’s sometimes called the “warrior rabbit,” the hybrid creature can be vicious and is unafraid to use its antlers in a fight. Though stories mentioning horned creatures and animal hybrids exist in cultures and texts worldwide, in the United States, the jackalope was “invented” by a creative hunter in Wyoming – paving the way for tourist attractions and cementing its place in classic Americana relic. While it’s now considered just a face for Wild West souvenirs, in ancient times, many thought a creature like a jackalope was real and multiple sightings were recorded. And like Bigfoot or the Loch Ness monster, belief is in the eye of the observer. The jackalope isn’t merely a work of human imagination. The creature has a history that dates back to a 1932 hunting trip of brothers Ralph and Douglas Herrick. After catching a jackrabbit, the pair went back to their Douglas, Wyo. family taxidermy shop and tossed the animal’s body next to a pair of deer antlers. Douglas had the lightbulb idea to mount it that way, thus creating the legendary American totem. 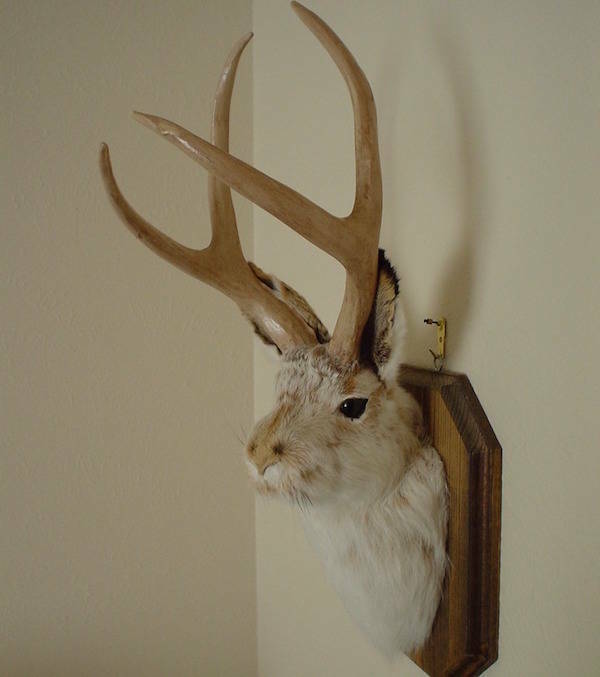 Herrick sold his first mounted jackalope for $10 to Roy Ball, the owner of the La Bonte Hotel. The bizarre taxidermied creature was so popular amongst the guests that it was later stolen right from the wall in 1977. But the belief that a jackalope-like creature existed even before Herrick’s idea. There are references to horned rabbits in scientific texts from the 16th century as well as medieval and renaissance folklore stories in Europe, Asia, Central America, and Africa. The origins and early sightings of these referenced creatures might have actually been rabbits affected by Shoppe papilloma, a type of cancer that causes horn-like bumps to grow from an animal’s head. In several folklore accounts of the jackalope, the creature is said to be even stronger and faster than its non-hybrid animal relatives, making it almost impossible to catch. If you do manage to catch up with the speedy animal, you’ll have to fend off being kicked, clawed, and gored with its antlers. But those who believe these creatures are hard to catch also know of a particularly alluring bait. Apparently, jackalopes are big whiskey fans and if you set a trap with the liquor, they’ll come running. Once intoxicated, the speedy creature becomes slower and easier to hunt. YouTubeMany legends exist around the mythical jackalope. In some variations, the jackalope is particularly smart, able to easily understand human speech and mimic it back. According to these legends, one of the jackalope’s favorite pastime tricks is to sit in the darkness aside a campfire gathering and echo the campfire songs back to the unsuspecting woodsmen. Cowboys have told stories where they heard their own voices sung back to them by invisible creatures crouching beyond the plains. Another legendary trait attributed to the female jackalope is the value of her milk, which allegedly possesses medicinal and aphrodisiac qualities. It can be found, albeit very rarely, in a few scattered markets. For those who do believe in the realness of the jackalope, one explanation for their rarity comes from their limited mating window. Allegedly, they only mate during lightning storms. In America, the creature remained a favorite staple in the town and state it originated in. It’s also a major means of attracting tourists. The Chamber of Commerce in Douglas issues official jackalope hunting licenses to tourists, which is good for two hours on one non-existent day, June 31. An applicant must also have an IQ higher than 50 but no more than 72. Wikimedia CommonsJackalope sculpture in Douglas, Wyoming. Hoopla over the animal hasn’t died down. 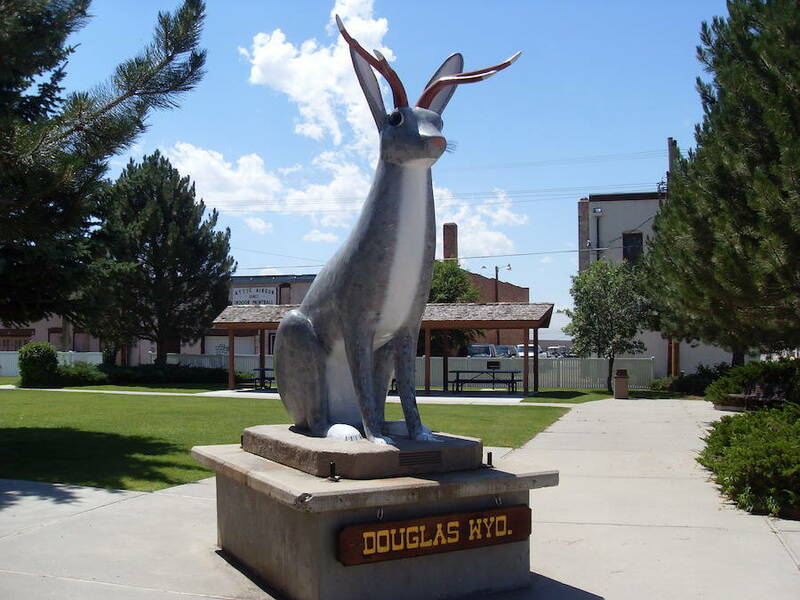 In 2005, sponsored by Dave Edwards, legislature was drafted to make the jackalope the official mythological creature of Wyoming. The proposed bill passed the house but died in the Senate. It was resurrected again in 2013, with the same results, and then again in 2015. “I’ll keep bringing it back until it passes,” said co-sponsor of the bill, Dan Zwonitzer. After learning about the mythological Jackalope, read about the “Siberian Unicorn” discovery that shocked scientists. Then read these weird Bigfoot facts.